No one can inspire humans with hope like Mother Nature and nowhere can she playfully display the greater extent of her will than in the garden of human mind. The summer of passion and recline, the autumn of loss and melancholy, the winter of despair and isolation and once again the spring of growth and the rebirth of hope. Through all cycles of life, it is only by tending to the garden and watching over it that one can notice even subtlest weeds of fear, for even the best of gardens may have weeds. Persian worldview and culture does not regard humans sans Nature. Islamic teachings consider Nature as a bed of signs that display the power of the creator of this world and therefore a source of meditation and wonder. A forerunner of world gardens, the Persian garden is a sanctuary where the creative forces of humans and Nature merge into another. Building gardens is an ancient art in Iran which includes its very own traditions as a material and spiritual representation. Although Persian gardens existed way before Islam began to spread in the country, Persian gardens continued to extend even more as Islamic worldview prevailed. These gardens were earthly symbols of the paradise above and also a figurative forecast of the other world, where the souls of the dead would eventually reside. Home to trees of sustenance, flowers of fancy, earth of peace and waters of love, the Persian garden was a complete and harmonious world on its own. Nature has run its very roots into the depth of Iranian living. There is even a specific day in the Persian calendar on which people reconnect with Nature. On the 13th day of the Persian New Year (Norouz), people leave the house to joyfully spend the day outdoors in the lush of nature. Known as sizdah-be-dar (literally meaning, getting rid of the unlucky 13 or taking 13 out) this ancient tradition has survived to this day despite the complications of modern and urban living. Even today you can still find families who take out their homemade lunch or dinner to parks and enjoy their meal outdoors on a rug spread on the grass with their family members, particularly on weekends. Baagh (Persian word for Garden) has even found its way into and flourished in Iranian pop culture. “Step into the Garden” is a saying used today when one wants to get someone to realize something that he is being oblivious of. Also “You are not even in the garden” means you don’t even have an idea what is being talked about or what is actually happening. The examples of course rise beyond “garden” as there are numerous anecdotes, proverbs and idioms in the Persian language that use many other natural elements. It is therefore no wonder if artists of Persian architecture took elements of nature into consideration to a great extent. Semi open spaces like granges and pavilions are platforms where space and nature reconcile both aesthetically and purposefully. Some of the Persian garden elements are still visible in Iranian parks today. These instances show how integral gardens were to Persian architecture and culture and how they served as a symbol of hope in the constant state of human exile on earth, hope for reuniting with the original and perennial home of which we have no personal memory and perhaps surviving that hope by creating a ‘replica’ until we can reunite with the ‘original’. A couple of years ago, one fine spring morning I was taking a walk in the beautiful Laleh Park of Tehran when I saw from a distance a tall tree with what seemed to be very long and extremely black fruits hanging from all its otherwise dry and bare branches. Naturally curious, I fastened my pace and almost ran towards the mysterious tree which stood far and secluded from the others. As I neared the tree, I looked with even more disbelief. From the lowest branch to the top, long narrow strips cut out of black plastic bags were fluttering in the spring wind, like a bald man wearing a wig or a black weeping willow. I looked around anxious for an explanation. A middle aged man who had seen me stare at the tree for a while told me that after a harsh winter, the tree had been barren for two successive years and one of the gardeners had decided to hang all those plastic strips from its branches to give it some hope that it could still bear fruits if it wanted to. I never really found out if the heart of the tree had warmed up to this story or if it ever became green again but I will always remember that day as a symbol of human’s effort to create a space for hope even when there is apparently room for none, even if believing in that hope may initially seem like being deceived into faith and courage. Sometimes when we walk on the pathway of meaning in another’s garden, we may eventually find one of our own. The archetypal garden, Paradise, derives its name and its symbolism from the Old Persian word “paridaida” and the Avestan word “Pardeiza”, which literally means, an enclosed area, walled-around space, for instance a walled garden. In fact, the term was later adopted by Christian mythology to describe the Garden of Eden or Paradise on earth. Standing up to their literal meaning, Persian gardens were initially structured as enclosed spaces and therefore offered an opportunity for relaxation and security to their inhabitants. In these gardens people could relax and indulge in spiritual meditation as they would connect with nature. They were also a great meeting place for leisurely activities among friends. Depending on their construction designs, Persian gardens served different purposes. While the formal design greatly emphasized architectural structure, the casual design focused mainly on creating natural landscapes. All the elements of the Persian Garden are purposefully employed to create a replica of the celestial or perennial garden on earth. After Islam came to Iran, Persian architecture was embraced and later integrated into Islamic architecture. In fact, the brooks and waterways which ran through these mesmerizing orchards could easily signify the four rivers of paradise. As described in Islamic texts, the inhabitants of Jannah (Arabic for Paradise, where the “good” souls go after resurrection) will be pleasant, with lofty gardens, shady valleys, fountains scented with camphor or ginger; rivers of water, milk, honey and wines; delicious fruits of all seasons without thorns. The colorful fruit bearing trees like pomegranates, apples, lemons, grapes and pears which would gleam red, yellow, purple and green red at dawn and dusk were symbols of the bright stars of heaven. The two main natural elements of the Persian garden, however, were water and sunlight. Sunlight and its effects were always taken into consideration in planning the structure of the gardens. Architects would chose shapes and textures to tame sunlight and harness its distribution. Shades and pavilions to block the sun particularly during summer were built with geometrical distancing all throughout the garden. Water was stored and also flowed across the garden in many forms. Qanats (a form of underground tunnel below the water table) and connecting wells were used to draw water for irrigation. Jooy or jub (closely translated as brook) running all through the garden were also constructed. Jub was actually a shallow ditch through which water flowed. Trees were often planted in jub as this prevented water evaporation and allowed the water quick access to the tree roots. In fact, these brooks are integral part of Persian architecture and they are still visible even in the urban structures of Iran. North Tehran, in particular has beautiful brooks flowing within its koocheh baaghs (literally meaning, garden lanes. Lanes that have trees and are pleasantly endowed with nature). Estakhr (swimming pool) and favareh (fountains) were also were also added in terms of aesthetic and purpose. There are four types of garden structures today. First, Chahar Bagh (literally meaning, four gardens) which consists of four quadrants divided by waterways or pathways. The pool or water way is the center and plants are often placed around its periphery. Hayat (literally meaning, yard or compound) is another type where man-made structures in the garden are particularly important such as arches and pools. Third is Meidan (literally meaning, field or center) which is a public and formal garden that centers more on nature and has the least possible structure. Fourth type is known as Park & Bagh (literally meaning, Garden Park). Much like many other parks, the Persian Park is a venue for relaxation and socialization with emphasis on plant life. There are many features that distinguish the Persian garden structure from world architecture. Designs pertaining to region and climate, geometrical patterns, harmonious style which results in a precise and intricate platform of creativity where aesthetics and purpose equally interact are manifest in the overall structure of the garden at a glance. In terms of direction, Iranian gardens at their very best are built stretching from the north to the south. The range of natural elements like trees, sunlight, flowers and water were considered in proportion in outlining the initial structure of the garden. What really distinguishes Persian garden from the gardens of other nations, however, is the unique and intricate geometrical design that governs it. Square and rectangle are the predominant shapes. Despite their precise spacing and order, Persian gardens still manage to create a range of different spaces within their main space by using various natural and man-made materials that differ in shapes and sizes. 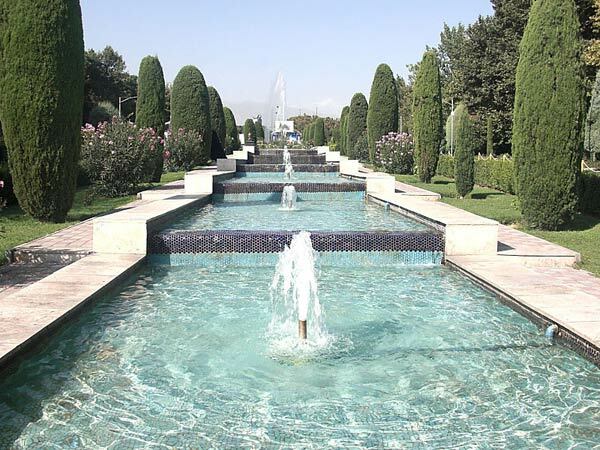 There are five elements which contribute to the geometry of Persian gardens. First and foremost is Perspective (or visual expanse of the garden). The greater length of the garden is where its most significant elements are situated. Known as the spine of the garden, this area helps to create a space for meditation and enjoyment from the day-to-day. Roads stretched into the horizon, brooks running to the end of the garden, little gardens within the main garden, the natural slope of the land and the difference in vision angle from different locations in the garden enriches the perspective of the space. Also, one of the main principles of Persian architecture is internalization and this is why gardens are walled and enclosed spaces. The second element is the water pathway. The main issue was to get water from distance points. For this purpose, Qanats and wells were dug and constructed in the heart of the garden. Water flowing from these points would run into well-spaced brooks and branch into different sections of the garden like water filled veins. The third element is the overall rectangular geometry of the garden. This shape made locating a precise place for planting trees and implementation of other structural elements much easier. It also helped to specifically frame a part of the earth by imposing a definite geometrical structure. The fourth element is none but symmetry which is known as the most comprehensive form of equilibrium. The granges in the garden were not only built symmetrical but were also situated symmetrically. Trees, shrubs and flowers were also planted this way. The fifth element is centralization of certain structures. This is manifest in placement of granges, particularly granges of the Hasht Behesth (eight paradises) design where granges are situated at the crossroads that divide the garden into different sections and therefore draw more attention. Hasht Behesht built in 1669 is a Safavid era palace in Isfahan. Just as the Babylonians were renowned for their legendary Hanging Gardens, Persian civilization is distinguished for its uniquely beautiful gardens which were initiated by the founder of the greatest empire of the world and the creator of the Achaemenid Empire, Cyrus the Great ( 600 BC or 576 BC-530 BC). In fact to many Westerners, Cyrus is also known as the “King of Four Baghs”. Recent excavation of his capital city, Pasargadae has led to traces of the Pasargad Persian Garden and a network of irrigation canals. Pasargadae was a place for two magnificent palaces surrounded by a majestic royal park and vast formal gardens; among them were the four-quartered wall gardens of "Paradisia" with over 1000 meters of channels made out of carved limestone, designed to fill small basins at every 16 meters and water various types of wild and domestic flora. The design and concept of Paradisia were exceptional and have been used as a model for many ancient and modern parks, ever since. Persians believed number four (4) to be extremely auspicious as the Zoroastrian worldview divided the world into four parts with its four founding elements (air, water, earth and fire). Therefore as a replica and an earthly symbol of the celestial world, the Achaemenid gardens too were divided into four parts. The vast lush gardens built by the emperor of Pasargadae were in fact a representation of his beliefs in creating fertile lands, a well-organized and harmonious world sans any internal or external disparity or disconnection. History says Cyrus the Great was the first to promote systematic tree planting with equal spacing. He also dedicated gold medals to the best trees and was the first ruler to give out agricultural awards. His interest in displaying new methods of using stone in architecture inspired him to create intricately carved water rills and shade-giving pavilions. His capital city was actually a complex of garden within gardens. Even his resting place is in the heart of a garden. 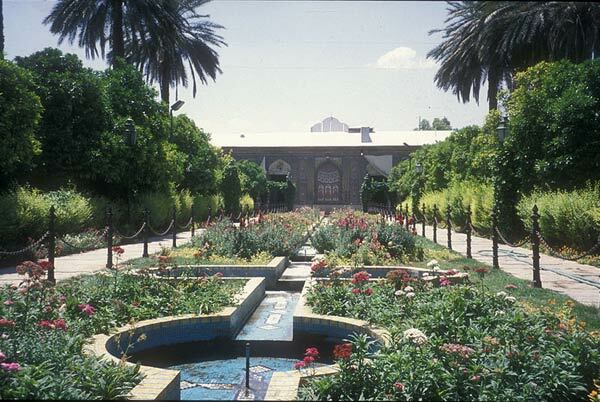 1- The Persian garden is registered on UNESCO's World Heritage List. 2- Persian gardens may originate as early as 4000 BCE. The outline of the Pasargad Persian Garden, built around 500 BCE, is viewable today. 3- Garden design of Persian gardens has influenced the design of gardens from Andalusia to India and beyond. 4- Charbagh (Four Baghs) is a Persian-style garden layout. The Chahrbagh-e Abbasi in Isfahan, built by Shah Abbas the Great in 1596, and the garden of the Taj Mahal in India are the most famous examples of this style. The Taj Mahal is one of the largest Persian Garden interpretations in the world, from the era of the Mughal Empire in India. 5- During the Safavid Dynasty, gardens were an integral part of the structure in the many cities of Iran. These gardens were of different sizes and shapes but two main structures stand out during this period. First, the Chaharbagh (quadrilateral garden) and second, gardens within palaces and houses. 6- The traditional Persian Garden design has also extensively influenced Persian carpet patterns. The main elements of the Persian garden are still visible in the layout of classic Persian carpet which is known as the garden style. This design also emerged during the Safavid period. 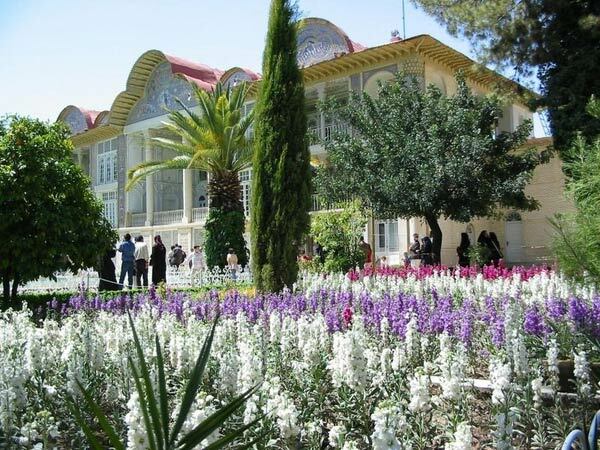 7- Eram Garden and Haafeziyeh Garden of Shiraz, Golestan Palace garden in Tehran and the garden of Darush Grand Hotel in Kish Island are some examples of Persian Gardens today. In the heart of Yazd desert, Abarqu County stands tall and proud one of Iran’s national monuments known as Sarv-e Abarqu (Abarqu Cypress tree). Also known as "Zoroastrian Sarv” and “Negin Sabz” (Green gem), this beautiful and evergreen cypress tree is estimated to be more than 4,500 years old. In fact, some scholars have opined that the tree may have been planted by Noah’s son, Yaft. Recent researches of scientists from Japan and Russia have revealed that the tree may be as old as 8,000 years. The tree is of the Mediterranean Cypress type and perhaps the biggest living plant on earth. Having been a witness to the dawn of the human civilization and storing the memories of the earth in its bulk and roots, many experts believe it to be the oldest living thing in Asia. With 25 meters height and 18 meters perimeter, the tree is a major tourist attraction of that area. Persian Garden added to UNESCO's World Heritage List - The Persian garden was registered on UNESCO's World Heritage List on Monday. The decision to register the property on the list was made during the 35th session of the World Heritage Committee, which opened in Paris on June 19. The meeting comes to an end today.